Have you ever felt chemical peels were too abrasive, harsh and packed with a tonne of side effects for your skin to handle? Dermalogica has filled in the gap by introducing their Pro Power Peel. One of a kind in the industry and after years of research and scientific backing, a resurfacing, peeling facial treatment has been introduced using gentle ingredients and gentle effects on the skin. Get ready to experience benefits such as skin resurfacing, smoother texture, even skin tone, brighter and radiant skin, fewer wrinkles and overall healthy looking skin. No downtime, no side effects – a simple yet effective exfoliation treatment carried out by professionals. You skin therapist will use a blend of Glycolic acid, Lactic acid, Mandelic acid, Salicylic acid after an analysis of your skin and the desired results. What to expect from a Skin Peel Facial? A results driven facial compared to a relaxing, pampering treatment, expect fabulous results on problematic skin from just one session. Less massage moves and strokes and more professional peeling, exfoliation and working with epidermal layers is what you can expect. What you can also expect is a professional strength facial that works in perfect symmetry with even the most sensitive skin. The chemical agent used and concentration of products will vary depending on your skin type and what your trained therapist diagnoses when it comes to individual skin. You can also expect skin to be slightly red and inflamed after the facial and increased sensitivity to sun, both of which can be dealt with using a protective SPF of 30 or above. For best results, use skincare as recommended by your trained therapist for at least 2 weeks after the treatment. Most clients experience noticeable results within 3 treatments, from fewer wrinkles and fine lines to smoother texture and reduced breakouts. Results will vary depending on your skin condition and how frequently you receive Peel treatments. Who is the Skin Peel Facial for? A biologically active peel, Pro Power Peel aims to slough off the top most layer of the skin and encourage the layer beneath to produce new skin cells, collagen and elastin. Hence making the treatment perfect for those suffering from fine lines, wrinkles, sun spots, hyperpigmentation, acne scars, uneven skin tone, dull-dehydrated skin and so on. Chemical Peels are one of the most popular professional skincare services today because they can improve the quality, texture and tone of the skin. But they can also produce severe side effects such as inflammation, discolouration and scarring for up to several months. 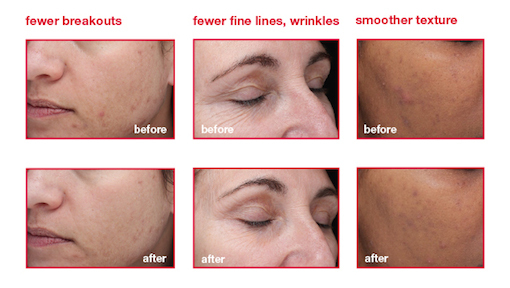 With our Pro Power Peel you can get the same powerful results without the associated risks or downtime. In fact, your skin will look and feel healthier than ever! Your professional skin therapist can assess your skin’s suitability for a Skin Peel with a Face Mapping skin analysis. In general, the peel can be tailored to your skin type. Pro Power Chemical peel is meant to work with the skin’s chemistry and not against it. When performed by a certified skincare professional, it safely removes dull outer layers of the skin and helps the skin underneath regenerate for better health and radiance. If you are looking for a biphasic peel facial that will demonstrate visible results, precisely target problem areas, work with the first two layers of skin whilst being kind and gentle with no added recovery time, opt for a chemical Peel. How often do I need a chemical Peel treatment? Your therapist will prescribe a series of 3 to 6 treatments depending on your skin concern and skin condition. Multiple sessions may be performed to achieved desired results. How should I prepare for a chemical Peel treatment? Talk to our skin therapist who may prescribe a pre-treatment solution for your skin type consisting of home-care products. As a general rule of thumb, it is good practice to discontinue the use of prescribed exfoliants such as Retin-A and Renova, at 48 hours prior to and during chemical skin Peel treatments. I used to take Isotretinoin (also known as Accutane), can I receive chemical Peel treatments? Yes, but only if you have been off Isotretinoin for more than 6 months. I am pregnant. Can I receive the Peel treatment? No. Your skin may be too sensitive for the highly acidic nature of the Peel. This will impact the frequency and results of the Peel Treatments. Ideally a series of treatments are performed over a three to twelve week period, followed by maintenance treatments twice a year. Immediately after the treatment, skin may appear red and flushed. As your skin goes through the renewal process, it is normal to experience dryness, redness and tightness, as well as some peeling or flaking within a week. You may also notice a temporarily more pronounced appearance of pigmentation as it rises to the skins surface. These side effects will subside quickly with proper post-treatment care starting with the Peel After Care kit. 1. Apply sunscreen protection daily following treatment. 2. Follow the prescribed post-care instructions. 3. Avoid direct sun for 2-3 weeks. 4. Do not wax or use any type of exfoliating products for 72 hours, or until your skin shows no signs of sensitivity on the treated area. 5. Do not pick or peel at scabs, blisters or loose skin, as scarring may occur. 6. Avoid excessive heat sources (such as sun exposure or dry saunas and steam rooms). 7. Avoid strenuous exercise or any activity that could lead to increase blood circulation to the face for 24 hours following treatment. (This can cause an increased warming effect, which could result in discomfort, redness, inflammation, swelling or other side effects).